Modern photos along the route. 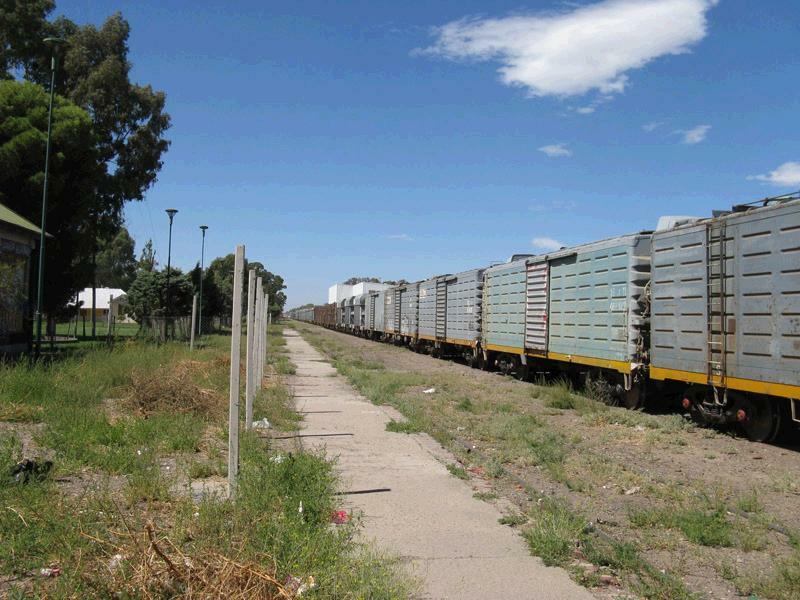 Ordered from Bahía Blanca westward toward the Andes. 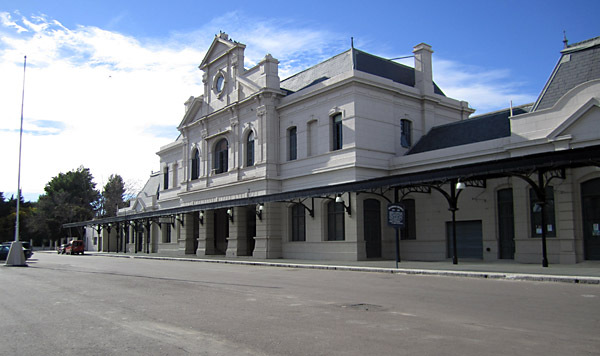 Bahía Blanca station still looks good from the town side. 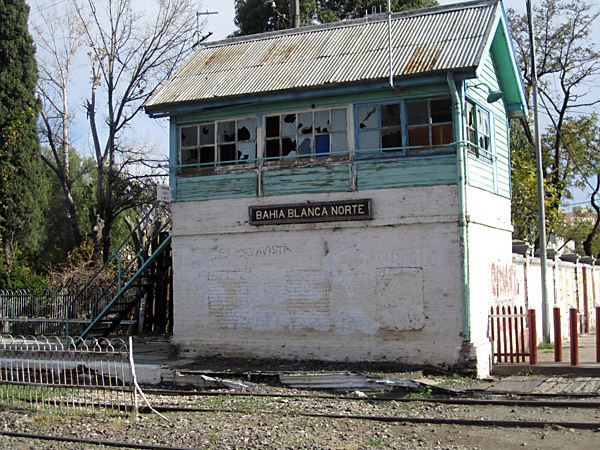 Bahía Blanca Norte signalbox, now disused. 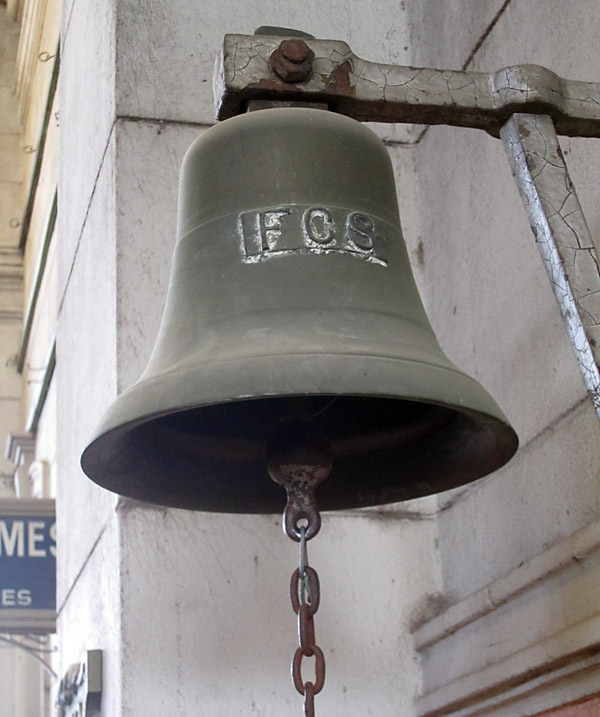 An FC Sud bell still in occasional use in Bahía Blanca station. 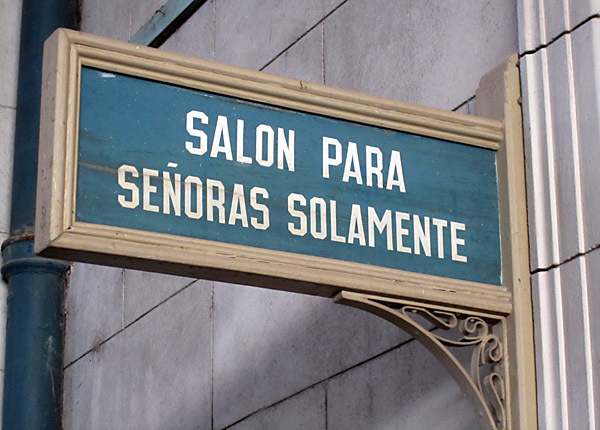 Traditional style room signs in Bahía Blanca station. 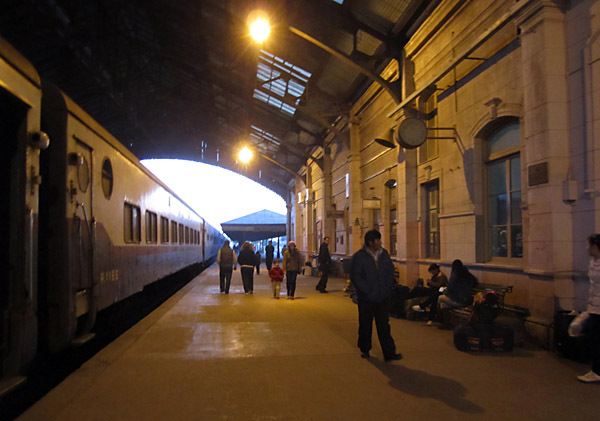 A view south along the platform as the nightly train to Buenos Aires prepares to depart. 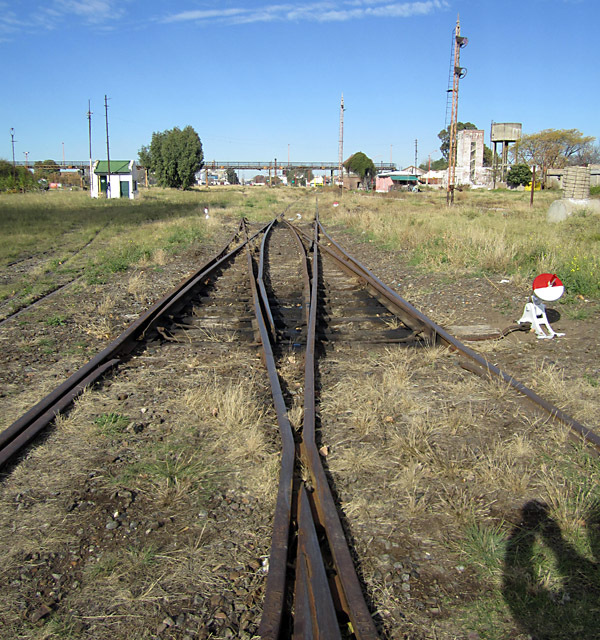 Just south of Bahía Blanca station a double-slip point is still in use. One of the FCS's standard 2-6-2T shunting locos, no. 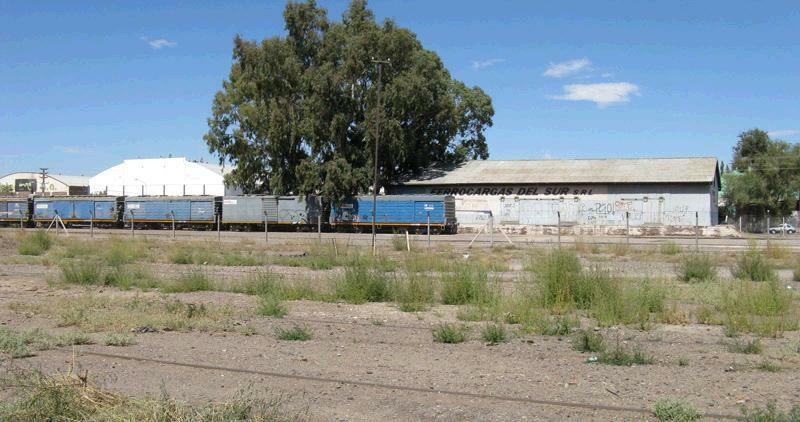 3337, stands outside the loco depot at Ingeniero White, the port south of Bahía Blanca. 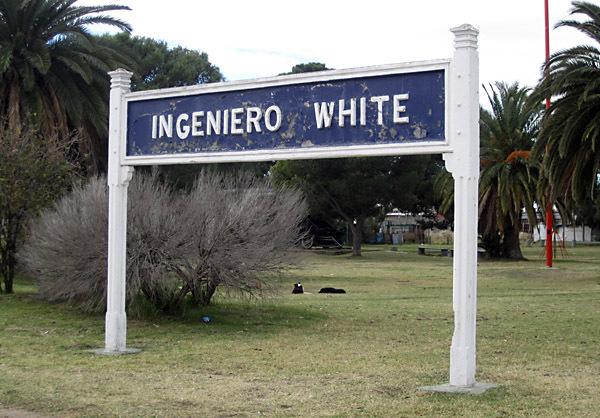 The station nameboard at Ingeniero White, now standing within a park rather than an active station. 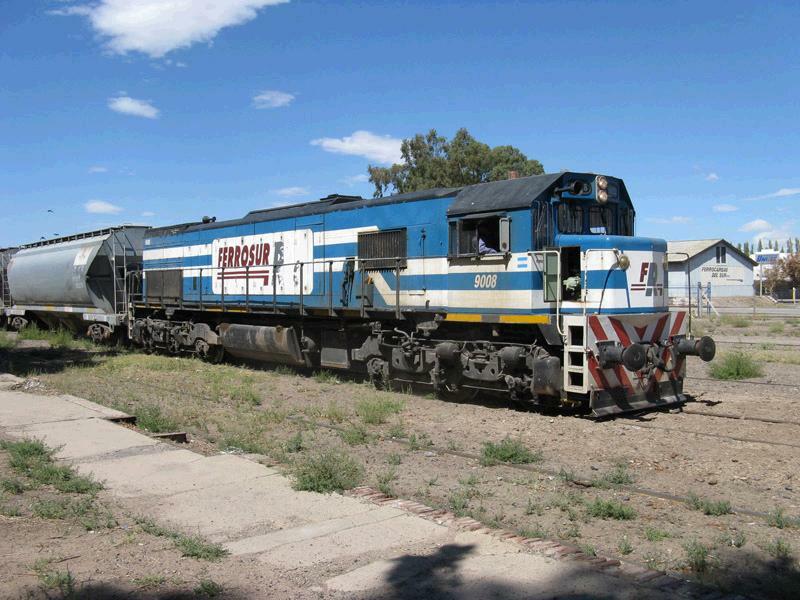 The park also contains ex FC Sud pacific loco no. 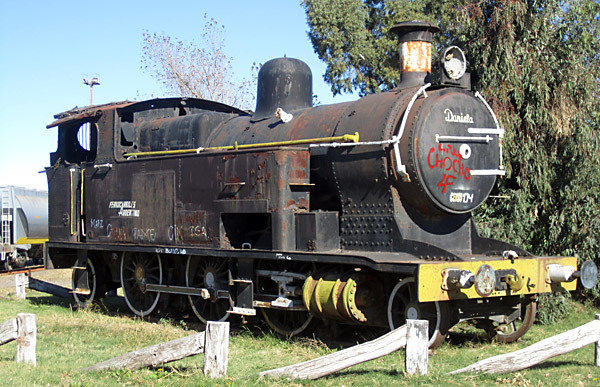 3913, built by Vulcan Foundry and assembled at Liniers workshops in 1938. 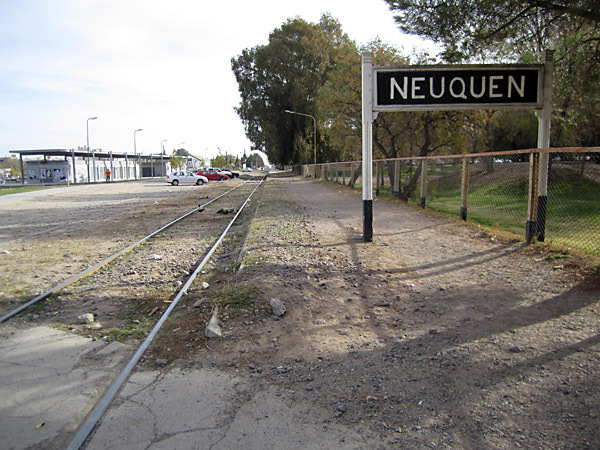 A view of the Neuquén station platform from the east, showing how there is now only a single track through the station site. 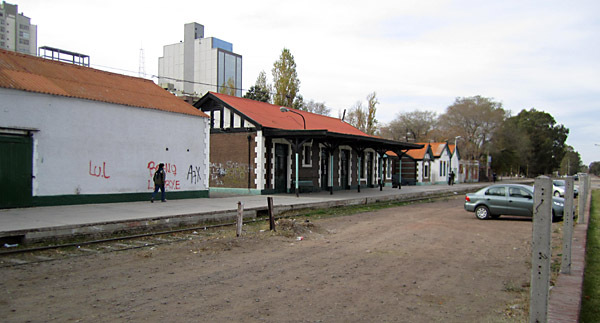 Neuquén station buildings from the south-west. 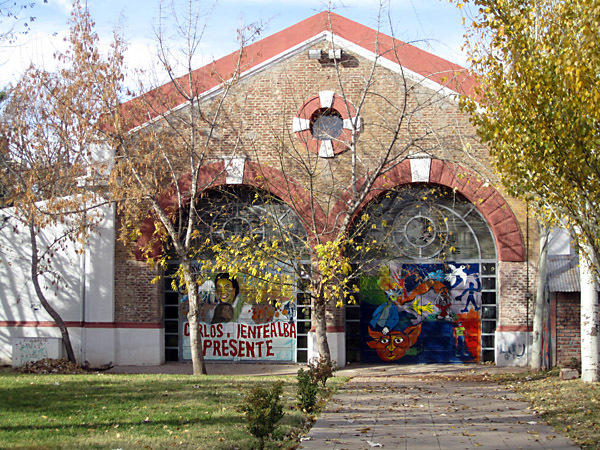 The old Neuquén loco shed is now a cultural centre. 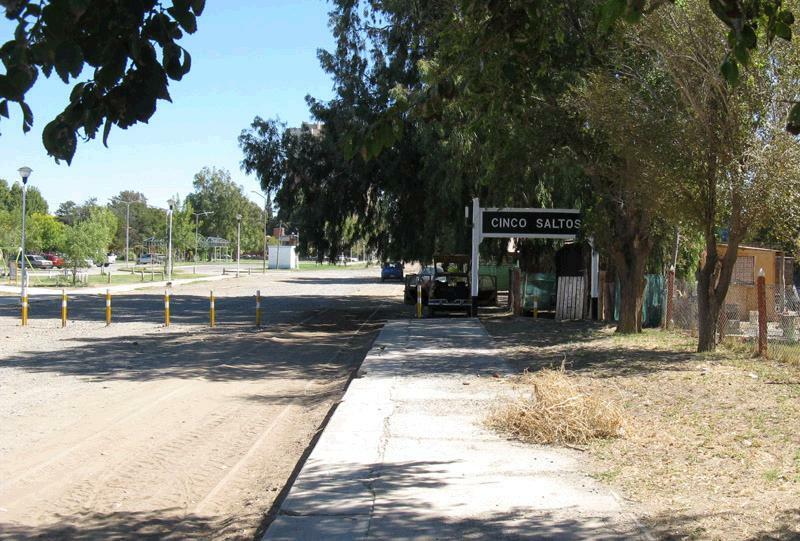 David Sinclair was able to visit the area in early 2014 and took a number of views at the terminus of the line which is located beside the main irrigation canal within a stone's throw of the end of the barrage. 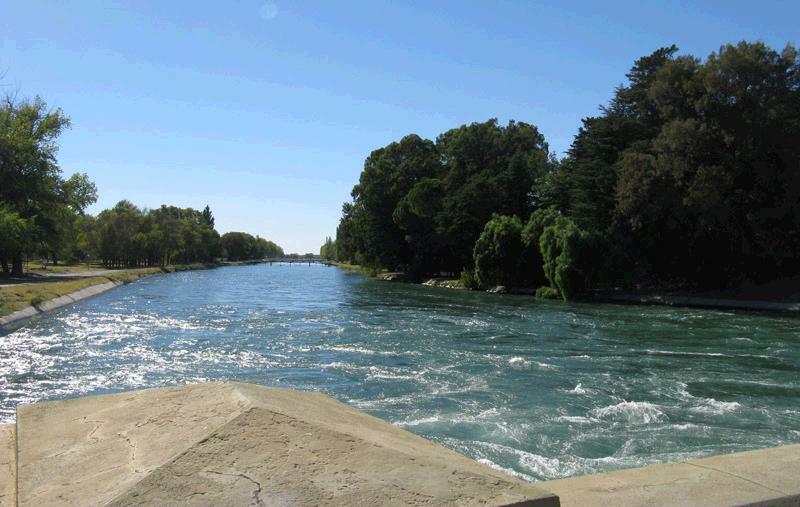 This is the take-off canal for the whole of the irrigation works just downstream of the draw-off from the Río Neuquén, hence the turbulence in the water as it races away. T he railway has gone, being replaced by a public park. 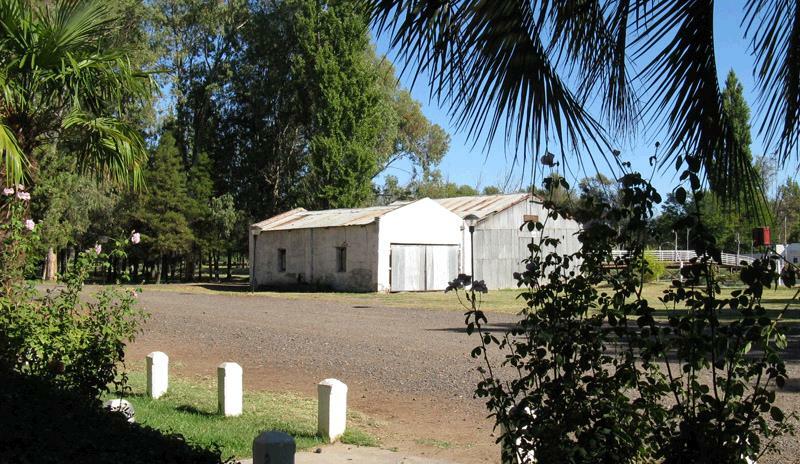 However, the two railway goods sheds have survived for park purposes. 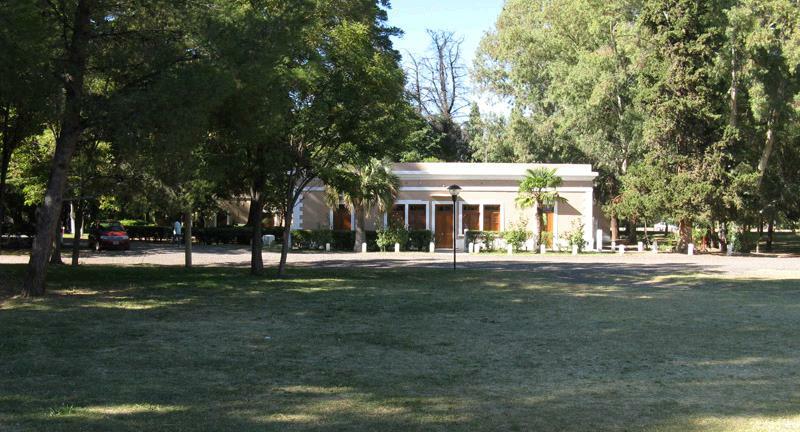 The offices for the construction works remain, now used to house the irrigation museum. 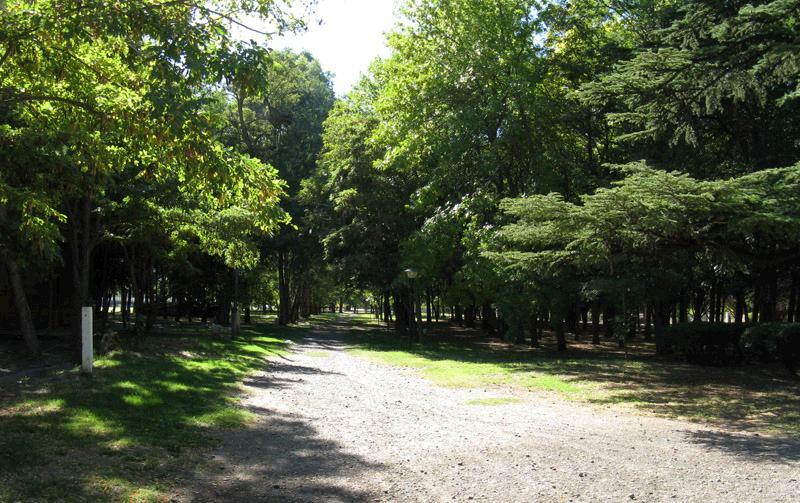 This pleasant sylvan path is the route the railway took on its way to Cipolletti. 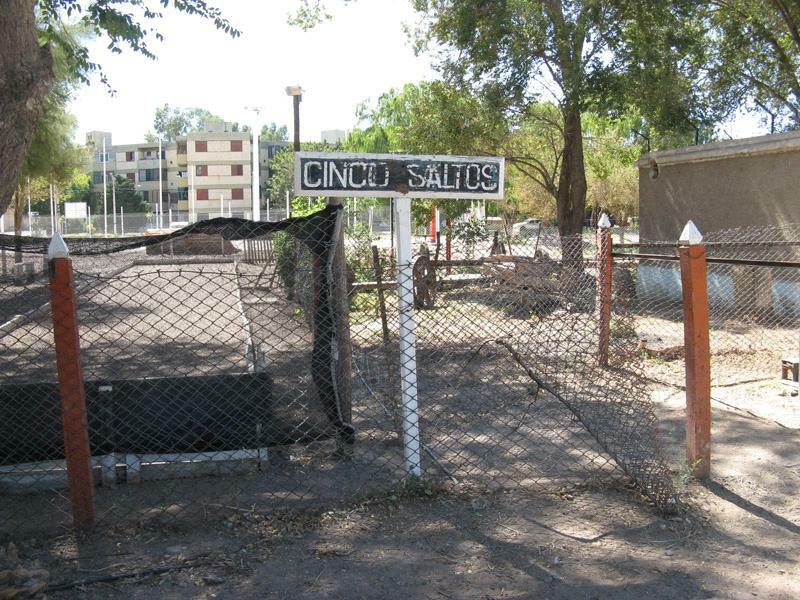 At Cinco Saltos, the principal line is nominally still available for service, but all the sidings have been lifted. 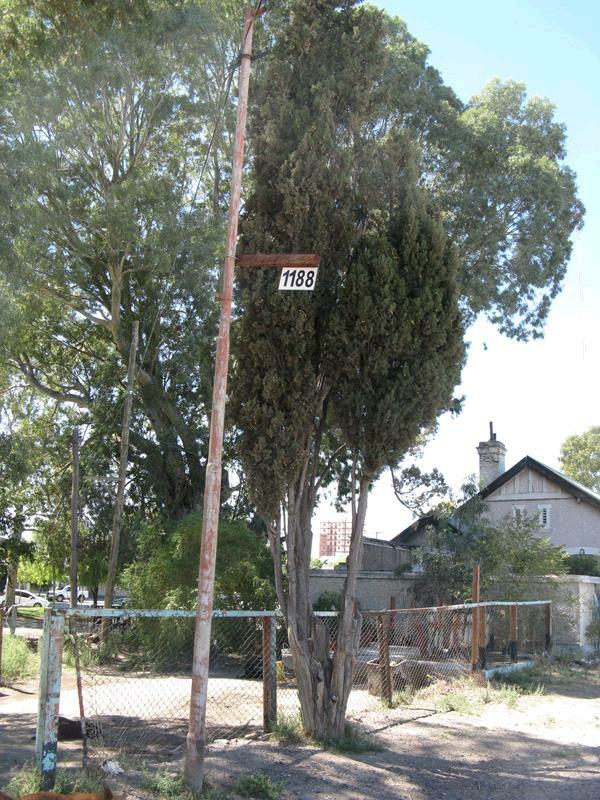 The FC Sud fence posts still survive around what was the station master's garden as does a small station nameboard. 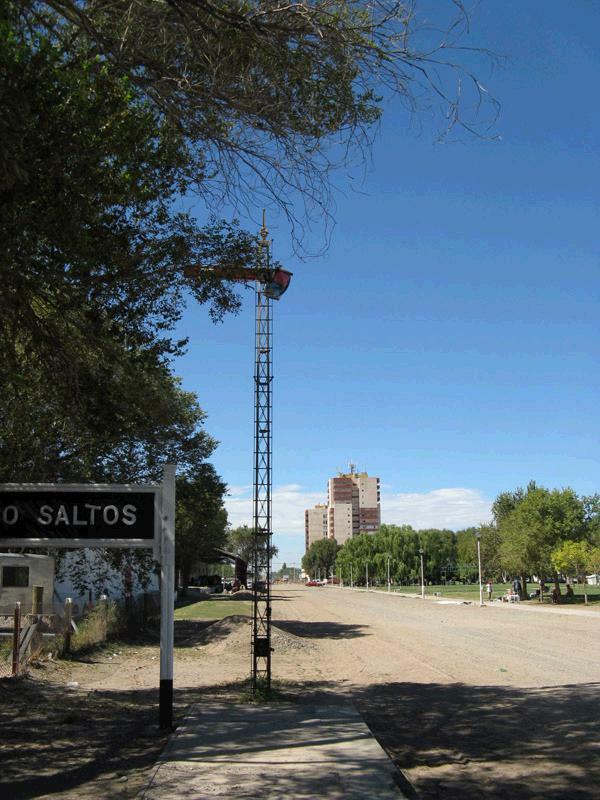 The down (Argentine definition) starting signal survives, though all the associated operating wires at ground level have been removed. At Cipolletti the station yard remains in use. The vans are for the traffic of a concessionary company for parcels traffic. 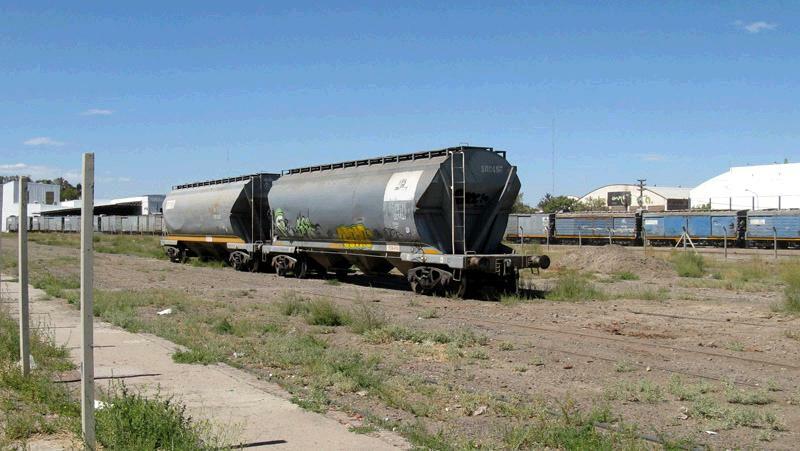 The company is called Ferrocargas del Sur or FCS. 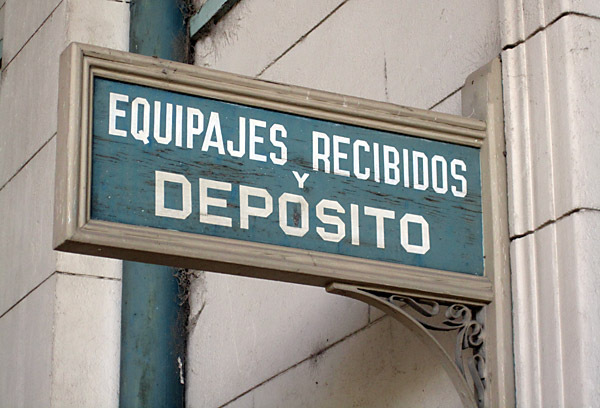 On a decrepit lamp standard on the station platform is the plaque indicating the mileage from Buenos Aires. While we were there a train came in making use of the secondary line. Typical of the area the train stretches away in to the distance.